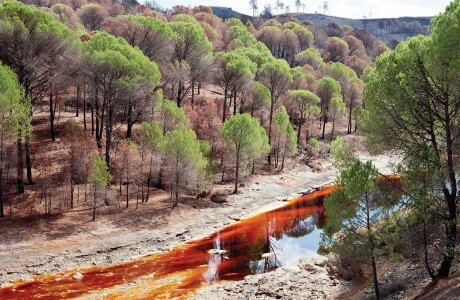 The long-dormant site of Spain’s first environmental protest in 1888, revisited. The brake is released and the engine sighs, before we jolt forward and are officially welcomed to the Rio Tinto Mines Railway Tour. We accelerate slowly. We pass all manner of workings left to rot in the high noon sun. Skeletal smelters cozy up to suspect foundations amidst red terraced hills running with gravel rivulets. Grand chimney flues dot the horizon. Rusting engines are strewn in the maze of abandoned track, offering a glimpse of a once mighty operation, the largest open-pit mine of its time in the world. Construction of the Rio Tinto Railway began in July of 1873, shortly after a newly formed British company, the Rio-Tinto Company Limited, was “ceded in perpetuity” the rights by the Spanish crown to this ancient mine in southwestern Spain. The railroad was completed two years later. 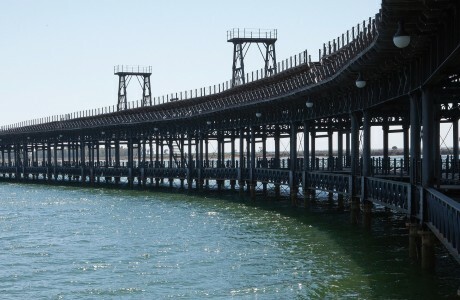 The roadbed followed the Tinto River from its headwaters in the Sierra Morena along the river’s 62-mile course to the port city of Huelva, where a three-quarter mile long steel pier was built to aid in the rapid transfer of mined materials from iron horse to steam ship. The railroad served three main purposes: it linked all the departments and operations of the mining company; it was a vital connection between the towns of Rio Tinto and Huelva; and it served as a commuter railroad carrying travelers and miners to the surrounding area. The railroad continued operation, in one form or another, until 1985 when the mine’s operation drew to a close. Today, it operates as a tourist attraction. 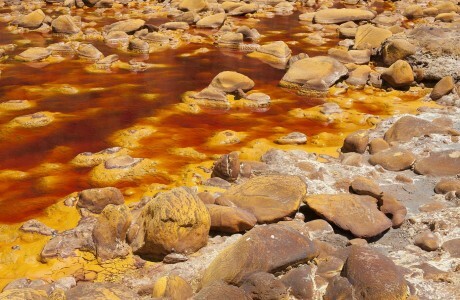 The Tinto River is more like a spreading lava flow than a free-running river. Murky clouds of sand and silt rise from its depths. Streams of sulfurous yellow and orange at various stages of rust blend into blood red. The tendrils of water resemble exposed capillaries of the Earth, bleeding out into the Gulf of Cadiz, as if a five-thousand-year-old wound is unable to cauterize. For the local population, the Rio Tinto is a natural wonder and a source of pride. Nearby residents contend that the tint of the Rio Tinto is a natural occurrence for which no industrious undertakings are responsible. And although the highly acidic composition of the Rio Tinto (pH 2) is caused by the natural and undisputed high concentration of metals and metalloids, consensus on the genesis of this caustic spectrum remains elusive, even among scientists. The river drains an area with huge deposits of sulfides, part of the Iberian Pyrite Belt, which was formed more than 350 million years ago. The Belt stretches from modern day Portugal east to Seville, Spain. When sulfides are exposed to air, water, and microorganisms, drainage from acidic rocks flow into surface and ground water. But sulfides are usually buried. Relatively few outcroppings are exposed. Mining, however, greatly increases exposed areas. And for at least five millennia, humans have been extracting—at various times and with varying results—the precious deposits trapped in these hills. Beginning in the third millennium bce, the indigenous populace began to mine copper, but only from exposed outcroppings or from shallow depths. Between 1800-1200 BCE, silver minerals were extracted from oxidized sulfides. By 1200–900 BCE, Iberian and Tartessian communities in the region prospered as suppliers to the world of metals, especially copper and tin—essential ingredients in bronze. Yet, for some not-yet-well-established reason—perhaps due to a major flood—Tartessian civilization collapsed and with it, mining, until the arrival of the Romans in 206 BCE. They conquered the area, expelling the Carthaginians, who had occupied the region for more than three hundred years. The Romans, with their technologies, made large-scale mining possible. They minted some of their first coins from the gold and silver extracted from the mines. With each advancement in tools and techniques, mines could be dug deeper, exposing more sulfides to air, water, and microorganisms, and causing the Rio Tinto to blush an ever-deeper red. To remove water from deep underground mines, the Romans designed water wheels. Sixteen wheels—one of which was discovered intact and is currently on display at the Rio Tinto Mining Museum—were stacked above one another. The wheels could lift water from 80 meters below the surface, creating 12 levels to the mine. For 200 years, the Romans worked the mines, extracting nearly 24 million tons of raw material. Yet, the mines did not prove profitable and were abandoned, left to the cavalcade of Iberian conquerors, Visigoths and Moors, to try their hand and suffer the same lackluster economic fate. The mines appear to have remained quiescent throughout most of the Middle Ages. 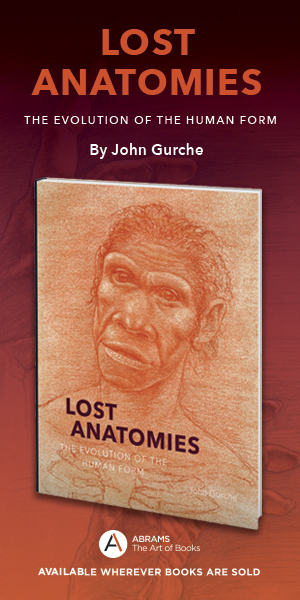 There is evidence of gold and silver exploration in the area during the sixteenth century. But the mines didn’t become fully operational until private grants were issued in 1725. By 1783, the Spanish government took over management of the mines, and by the end of the century, the mines were producing more than 10,000 tons of minerals per year. The demand for copper—with its multiple uses in the burgeoning electrical industry—increased manifold in the early nineteenth century. And the chemical industry had a growing need for sulfuric acid for fertilizers, explosives, and other products. Production at the Rio Tinto mines, however, was declining because of poor management. It came to a halt from 1808-1814, during Spain’s War of Independence. After the war, the Spanish government again turned to the private sector to improve the performance of the mines. A 20-year lease (1829–1849) was granted to the Marquis de Remisa, a Catalan banker. New smelters, that needed significant amounts of wood and caused the disappearance of the surrounding trees, were constructed. In 1839, calcinations in “teleras” [a technique whereby large quantities of harvested ore are set atop large platforms of stone and wood, and fired in the open air] began to be used for the low-grade copper ores. This method involved the slow roasting (over six to seven months) of 40–50 tons of ore in conical heaps to remove the sulphur. Then, the roasted ore was placed in tanks with acidic water to dissolve the copper and cementation then produced copper in contact with iron scrap in channel systems. The increased output from the Rio Tinto mine triggered a proliferation of sulfide mines in the area. 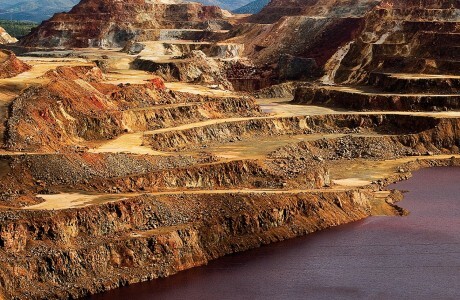 With the expiration of Marquis de Remisa’s twenty-year lease, the Spanish government resumed management of the Rio Tinto mines in 1850, when the mines were producing 25,000 tons of sulfides per year. Production continued to increase for a time, but by 1870, after multiple problems, production ceased and the Spanish crown again put the mining rights back on the market—for what appeared to be the final time, when they were sold to the Rio-Tinto Company Limited in 1873. 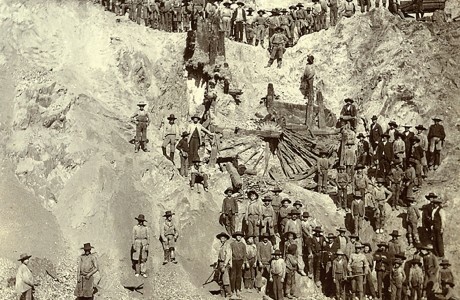 At first, the operation was underground, but opencast mining quickly began in the South Lode (1876), three open pits in the North Lode (between 1890 and 1900) and at Atalaya (1910). In 1878, only five years after the purchase of the mines, extraction reached 900,000 tons, 10 times more than the previous maximum production. For mineral processing, a new smelting plant and a factory for sulphuric acid production were constructed. Higher-grade minerals were intended for smelting or exportation. Lower-grade minerals were accumulated in large areas, directly or after calcination by “teleras,” for leaching and recovery of copper. The calcination “teleras” aggravated environmental and public health problems. Before the British company began operations, nearly half a million trees stood on the banks and hillside of the Tinto River. They had been planted by the Spanish government in the mid-nineteenth century—after the deforestation by the Marquis de Remis operation—to be used as a perpetual source of timber and to benefit the environmental health of the region. This new owner’s open-air calcination didn’t remove trees; it decimated them. Mounds and mounds of burning minerals—two million tons per year at the height of mining operations—created noxious clouds of sulfurous fumes, as poisonous as they were pungent—up to 600 tons of toxic gases per day, which triggered acid rain across an area of several hundred miles, equal in size to that of the Iberian Pyrite Belt. Pestilential to the surrounding farmland and carcinogenic to the local population, these clouds of calcination did have a third, and perhaps unexpected, consequence. On February 1, 1888, miners, joined by local farmers and their nascent Anti-Smoke League, went on strike, commencing the first environmental protest in Spanish history. Three days later, 12,000 men, women, and children marched on the town of Rio Tinto, calling for an end to calcination, a process that had been outlawed 24 years earlier in England. The company responded with gunfire. Several volleys were fired directly into the crowd, killing a still-disputed number of people, marking a bloody coda to the strike, and providing the impetus for the tragically romantic sounding, “el año de los tiros” (“the year of the shots”). The natural oxidation of sulfides in the Iberian Pyrite Belt predates human impact on the area by at least two million years. A recent palaeomagnetic study more precisely dates these rock formations, or gossans, and the subsequent release of metals and acidity to the late Oligocene, some twenty-four million years ago. And although the effect of rocks on rivers is not unique to the Iberian Pyrite Belt, the magnitude of the effect due to the enormous size of sulfide deposits is worth noting. 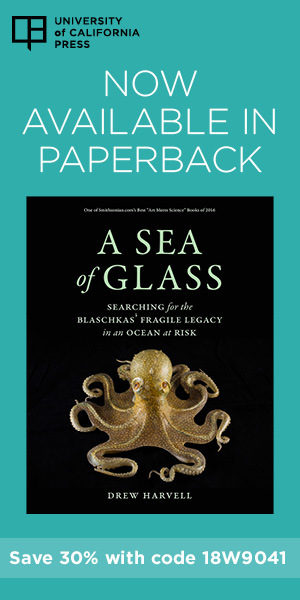 The amount of pollutants released annually over 24 million years—before mining—can be calculated, as shown in the study by Olías and Nieto, and in other recent studies. Those amounts were three orders of magnitude lower than the quantity currently transported annually by the Río Tinto. We also visited another cave which was full of water and from under which sprang a river said to be the Río Tinto...No fish or other life existed in this river, neither do people or animals drink it, nor are its waters used for anything else…It has another property that if you place iron in the water it dissolves in a few days. This I tested and proved myself. I took a live frog and threw it in the river and it died without being able to leave the water. 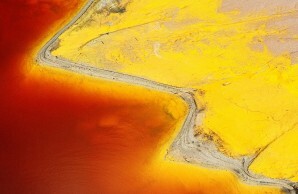 Extremophiles are able to live in the Rio Tinto. Although the river is still without any visible forms of life, it has abundant extremophile organisms that have adapted to its unique Earthly conditions. Their ability to survive could be a clue to the possibility of life on Mars. Since 2003, NASA’s Astrobiology Institute and Spain’s Center for Astrobiology, have been studying the river. They have found hundreds of species of one-celled algae, fungi, yeast, amoebas and other microbes, some of them apparently unique to the river. In addition to their scientific explorations, a team from the two institutions has tested a remote-controlled robotic drill system for future Mars exploration through the MARTE campaign (Mars Analog Rio Tinto Experiment). While the river’s condition may be, as one scientist has concluded, largely natural, a result of bacteria turning sulfur and iron into sulfuric acid and iron oxide, mining has greatly exacerbated the condition and contributed to the degradation of the region’s environment. The large metal and mineral deposits in the Iberian Pyrite Belt make their extraction irresistible. The costs of extraction, combined with political pressure and depressed commodity prices, however, prompted the Rio-Tinto Company Ltd.—with its right in perpetuity—to sell two-thirds of its shares in 1954, and the balance in subsequent years. Management returned to Spanish control. In 1966, a new company was formed with new plans and high hopes to build a smelter and a sulphuric acid plant in the Industrial Pole of Huelva. In the 1970s, however, pyrite mines declined due to competition from sulphur extracted by other industrial processes. And in the 1980s, the demand for copper and sulphuric acid dropped. 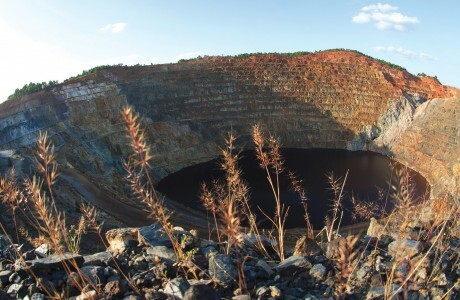 The public, with a growing environmental awareness of the toxic residue from the roasting of pyritic minerals, pressured numerous mines in the region to close. Copper production in Río-Tinto mine was abandoned by 1985. Gold and silver mining remained. However, in the late 1990s, underground mines and much of the open-pit mines became flooded due to the abandonment of drainage pumping. The Rio-Tinto mine was decommissioned in 2001. Just when it feels like the final chapter in the epoch-spanning saga of the Rio Tinto and its mines has been written, new conditions, new needs, and perennial greed tempt once again, and appear so necessary and so easy, to open a vein and let the ore pour out. The price of copper has risen. The country is still mired in economic crisis. Nearly one in four people are unemployed and 40 percent of the youth population is in need of work. Any job creation, regardless of how many jobs it creates, is seen as a good thing. It puts food on the table and money in the pocket.